When a young pup is brought home, they're being exposed to a new and scary world. They've just been separated from their mother and have to navigate a new environment while maturing and learning how to behave. Because of this, it's not uncommon to hear cries of attention. Owners may be met with an adoring set of puppy dog eyes and have a constant follower throughout your day. This stage in their development is crucial. Everything they experience will have an effect on how they are as an adult. While most new owners have no problems spending time with their new furry friend, exactly how much attention does a puppy need? Truth is, puppies need a lot of attention, but not as much as many would think. 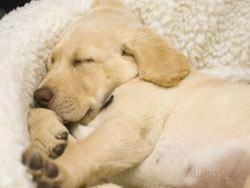 Puppies spend up to 16 hours sleeping. They'll only be awake and alert for a few hours during the day. It's during this time that owners should supply lots of love and attention. Most of this time is spent training and forming a strong bond with the puppy. New puppies can't hold their bladders for a long time, so owners need to take them out frequently to avoid accidents and create a sense of familiarity. Early training will create a strong foundation of skills while forming a routine they will follow throughout their lives. The same idea goes for socialization. Because they don't have their mother around, they will look to the owner to fill that void. They'll need constant love and support to get them through this tough stage in their lives. 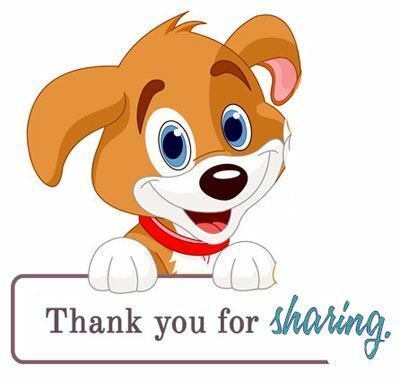 Owners should take this time to build a connection with their dog and expose them to new experiences. 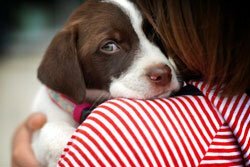 While it may be easier to keep them contained as they get housebroken, this can lead to socialization issues in the future. 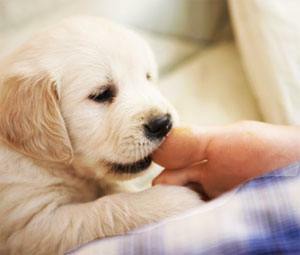 By exposing them to new people and dogs as a puppy, they'll be less likely to experience problematic behavioral issues. Is There Such a Thing as Too Much Attention? Despite their constant need for attention, it's important that owners don't give in too much. It's not uncommon for dogs to constantly whine and cry as a puppy. New owners will often come to the rescue to make them feel comfortable. However, this can lead to a development of bad habits and separation issues. 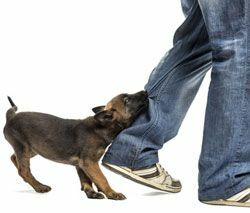 By over-coddling a puppy, they will rely on the owner too much and this habit will extend beyond their puppy years. Puppies that always get attention will essentially take advantage of it. They'll make a connection between their whining and getting the owner to do something. Eventually, whining will become a trigger and they'll rely on it to get their way. If the whining is caused by loneliness or fear, owners sometimes just need to give puppies their space. It can be tough, but these young pups need to figure some things out on their own. As they get used to their surrounding and new way of life, they'll eventually stop whining and know how to comfort themselves. As a rule of thumb, owners shouldn't give them any more attention, other than training, than they plan to do when they are an adult. Stress and anxiety are far too common with young puppies. This is especially true when they're separated from their new owner. Because of this, many owners believe that they have to stay home with the pup at all times. However, this will only exacerbate the problem. If an owner spends all day with their puppy, the dog will get used to having them around. 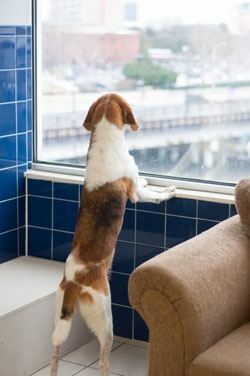 When the owner then goes back to work or simply leaves the house, the dog will become stressed from their absence. As mentioned earlier, dogs need to get used to a routine at a young age. Accommodating their every need now will only make it more difficult as they get older. The best way to handle separation anxiety as a puppy is to make small changes. Owners shouldn't clear their schedule to be with the puppy, but rather make time small changes for training. Something as simple as going home during a lunch break to let the new puppy out can prove to be beneficial. They'll slowly get comfortable with being alone while still retaining their bathroom training. To make their time alone more comfortable, it's important to give them things to do and create a comfortable space. Whether it's a crate lined with training pads or a designated room, it's good to fill it with toys. They'll learn to entertain themselves while the owner is gone. One of the most frustrating things a new owner may deal with is getting the puppy to sleep comfortably throughout the night. Due to their erratic sleep patterns, puppies may remain awake. It's important to create a routine for the pup to ensure that they don't whine throughout the night. The worst thing an owner can do is give the puppy attention whenever they wake up and start whining. They need to learn how to sleep throughout the night away from the owner. This can be achieved by putting the puppy to bed at the same time every night. They should be fed and let out before bed to let them know its time to sleep. Again, creating a safe and comfortable space to sleep in is crucial. One thing to take note of is that this space should never be used as punishment. Puppies that are forced into a crate or room every time they whine will associate it with a place of punishment. Instead, they should be made comfortable so they willingly retreat there. To sum up, puppies do need to have quite a bit of attention, but not so much that they begin to rely on that attention to function. During this time, puppies are building skills and a familiar routine. Aside from the additional training, owners shouldn't give them more attention than they'll get as an adult. This will help prevent over-reliance and bad habits. Typically, puppies will need up to 3 hours of care separated throughout the day for training, socialization, and exercise. With the right amount of attention, puppies will grow up to be happy, healthy, and well-behaved.